When Walt Disney and Paramount Pictures decided to make a movie based on the popular cartoon strip Popeye, the production team picked the opened faced Anchor Bay in the north-west corner of the Mediterranean island of Malta, two miles from the village of Mellieha, as location for Popeye’s fictional village of Sweethaven. 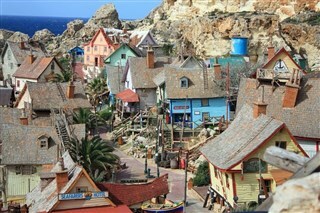 When Walt Disney and Paramount Pictures decided to make a movie based on the popular cartoon strip Popeye, the production team picked the opened faced Anchor Bay in the north-west corner of the Mediterranean island of Malta, two miles from the village of Mellieha, as location for Popeye’s fictional village of Sweethaven. Construction of the film set started in June 1979. A construction crew of 165 worked over seven months building the village as described by the comic strip’s creator E.C. Segar. Nineteen. Authentic wooden buildings were built from hundreds of logs and several thousand wooden planks imported from the Netherlands, while wood shingles used in the construction of the roof tops were imported from Canada. Eight tons of nails and two thousand gallons of paint were consumed in construction. In addition, a 200–250 foot breakwater was built around Anchor Bay's mouth to protect the set from high seas during the shooting. Filming commenced on January 1980, and the live-action musical comedy featuring Robin Williams playing as Popeye the Sailor was released on December the same year. Although the movie earned three times its budget, it was written off as a flop because it was nowhere near the blockbuster that Paramount and Disney had expected. Today the movie set is open to the public as an open-air museum and family entertainment complex. Aside from the village itself, there are boat trips around Anchor Bay, audio-visual shows which includes clips from the actual film and the set's construction, water trampolines, mini golf, and other games and fun activities for a great day out during your Malta holiday.